A new-look Edinburgh Monarchs team gave a good account of themselves at Ashfield Stadium tonight against Glasgow Tigers in the first leg of their Scottish Cup tie. Tigers triumphed 50-40 but it certainly wasn’t a cricket score as some Tigers fans had been predicting, and Monarchs certainly pushed the Tigers all the way. Monarchs team manager Alex Harkess said: “I was quite pleased with our overall performance. It was disappointing to be just two points behind and then we lost two 5-1s in the last two heats which made a bit of a difference. “But 10 points is in the middle and we have a chance in our home leg on Friday, it was just a pity we had done so well until these final two races, but that’s the way it goes sometimes.” Considering two of Monarchs’ new signings, American Max Ruml and Swede Joel Andersson, were making their UK debuts it might have been preferable if Monarchs had not started the new season away from home but the pair didn’t seem overawed by the occasion. 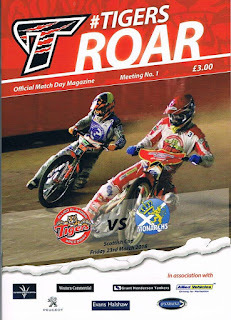 Glasgow were minus their big winter signing, Chris Harris, who was absent for personal reasons and they used rider replacement to cover for him. After the first race was shared the Tigers jumped into a four-point lead, 11-7 after a brace of 4-2s in the second and third races. But Monarchs’ new captain, Erik Riss, won the fourth race in great style after a hard-fought battle with Tigers No.1 Richie Worrall. And Monarchs claimed their first advantage of the match in the fifth heat when Ricky Wells and partner Ruml swooped for a 4-2 of their own against Claus Vissing and Paul Starke. This cut the Tigers’ lead to just two points, 16-14. Monarchs then took the lead, 19-17, with a brilliant 5-1 from Erik Riss and reserve Matt Williamson over Lewis Kerr and Worrall. 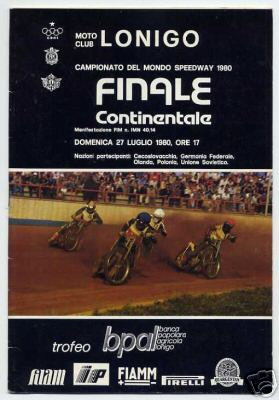 However, the Tigers hit back straight away in the seventh race with a 4-2 from Starke and newly-signed reserve Jack Thomas over Mark Riss and Andersson to tie the scores at 21-21. Glasgow regained the lead with a 4-2 in the eighth heat and with heat nine shared Tigers maintained their slender two-point advantage. Erik Riss was unbeaten going into heat nine, but could only finish in third spot. However, his partner Josh Pickering picked up second place behind race winner Starke to collect his first points of the meeting. Glasgow began to exert their authority in the tenth race with a 5-1 from Worrall and Kerr over Mark Riss and Andersson. This maximum advantage gave the Tigers a 33-27 lead and Monarchs needed to be careful not to let their rivals pull away, especially as Andersson was struggling a little to put any points on the board. Monarchs were digging deep to keep in touch and although Vissing won heat 11 for the home side Wells and Ruml kept Thomas at the back for a share of the spoils. Ruml looked impressive despite tumbling off in his third ride. Monarchs were still six points behind but not without a chance of winning the meeting and their performance at this stage was a vast improvement on some of their showings in 2017. Their deficit remained at six points after heat 12 was shared. But in the big heat 13 battle Wells and Erik Riss stormed to a brilliant 5-1 over Worrall and Kerr to cut Tigers lead to just two points, 40-38 with just two heats to go. Williamson replaced Andersson for Monarchs in heat 14 but he and Pickering lost out to Tigers reserve Thomas and Vissing who scooped a 5-1 to restore Tigers’ six-point lead again, 45-39, with one race left. Vissing did superbly well to take the chequered flag. In the final heat Tigers duo Vissing and Starke gated for a 5-1 over Erik Riss and Wells for a 50-40 victory and a ten-point lead to take to Armadale on Friday for the second leg. 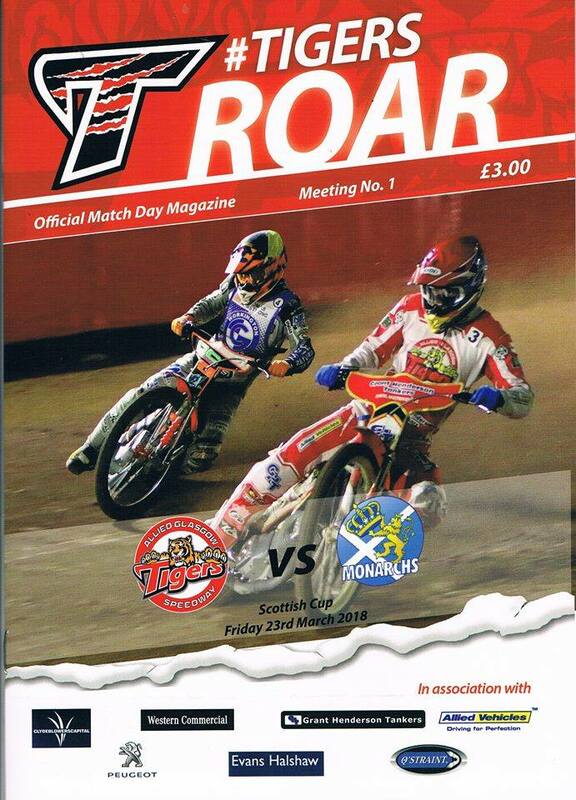 Tigers: Vissing 13, Starke 12, Kerr 9, Thomas 7, Worrall 6, Sarjeant 2. Monarchs: Wells 11, E Riss 9, Williamson 8, M Riss 7, Ruml 3, Pickering 2, Andersson 0.